Goldschmidt wrote he couldn't "thank Taylor enough for wanting to help make this day so special"
It's an engagement that was Taylor-made. 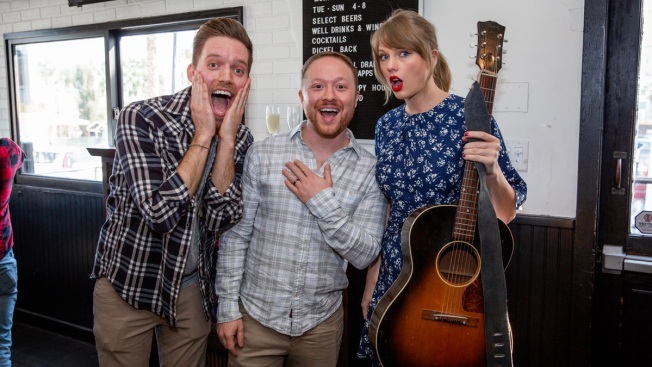 Alex Goldschmidt posted video on Instagram of a surprise Taylor Swift appearance as he got engaged to Ross Girard at the Sycamore Tavern in Los Angeles on Saturday. Everyone was excited as Swift came into the room with an acoustic guitar. The singer told the crowd Alex had emailed her and said "there was a song that was very special to you two called 'King of My Heart.'" Swift said, "This is from Alex, but sung by me." Goldschmidt wrote he couldn't "thank Taylor enough for wanting to help make this day so special." Swift is preparing to appear in the film adaptation of the musical "Cats."